If you have lost someone you deeply love, or have become strongly aware of your mortality, it’s hard to avoid wondering about life after death, the existence of God, notions of heaven and hell, and why we are here in the first place. The murder of Matthew McKay’s son, Jordan, sent him on a journey in search of ways to communicate with his son despite fears and uncertainty. Here he recounts his efforts — including past-life and between-life hypnotic regressions, a technique called induced after-death communication, channeled writing, and more. SEEKING JORDAN author Matthew McKay, PhD shares powerful insights he gained about the purpose of life through channeled writing sessions with his son Jordan who was murdered in San Francisco in 2008. 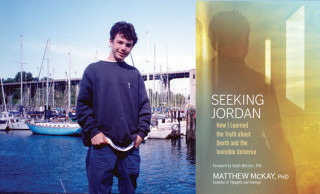 SEEKING JORDAN author Matthew McKay, PhD shares powerful insights he gained about love’s eternal nature through channeled writing sessions with his son Jordan who was murdered in San Francisco in 2008.